This coffee house is an all day dining restaurant opening for breakfast, lunch and dinner. 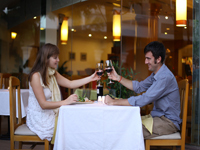 It features a wide selection of local, Asian and western delights a la carte or buffet (depending on the seasons). Grand View Terrace : This outside area showcases our traditional nightly Apsara Dances where the dancers are from the villages. They perform nightly all year round and the hotel undertook this as part of their Corporate Social Responsibility (CSR) programmed to engage their services with a monthly salary, pay for the dance teacher as well as their costumes, pay for monthly food allowances including utilities as well as provide transportation to and fro from their village. Thus the entire troupe comprises 50 - 60 members in total. Depending on the weather, the performance may be held in the Grand View Restaurant. A special tailor made booklet will be given (in progress) to all guests with their names written in Khmer when they dine at the restaurant. Seating Capacity: 160 persons are excluding the Grand View Terrace. Engage in the tales of the mystical Angkor Wat with your friends whilst you wander your time away on a cup of Early Grey Tea or a dash of Bailey's Irish Cream. 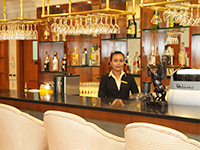 This lobby bar serves a variety of light refreshments, exotic coffees and teas with sweet delights. Enjoy famous Cambodian Afternoon tea or the light snack menu. Periodic live performances will enchant you in the evenings. This casual cozy pub serves delectable Asian / western snacks, cold beer and a truly amazing selection of cocktails. 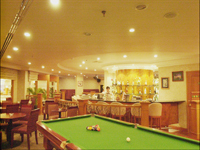 Continue with an exciting game of darts, billiards or even a game of Scrabble. 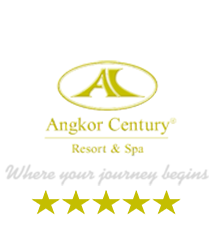 The casual and cozy atmosphere will definitely entice those songbirds to try their repertoire at the Karaoke (sing-along) from our extremely wide selection of approximately 43,000 songs in seven languages. Location: On the first floor. 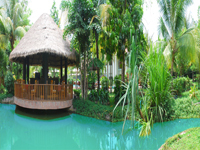 Set amidst a tranquil garden setting by the poolside, this is the ultimate venue to enjoy a sip icy cold beer or a healthy drink. Refreshments and light orders available. You can enjoy feeding the fish at this Lagoon Bar. This activity is known to be very therapeutic and relaxing. These fish are bred in its natural environment and hundreds of fish live in our eco-friendly pond.